It is now obvious to me the general public never gets that far before wanting to ask me a question on beer stein dollar values. So I have had to move them forward as I am getting tired of copying them and sending them back to people as an answer to their “stein value?” questions. This was meant to be an informational web site only. 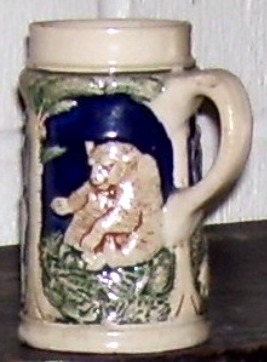 The “Teddy Roosevelt” German kinder mug. 1/8 th liter, pottery relief. Circa 1909. Teddy Roosevelt on his African trip, 1909. When a store owner in Brooklyn saw the cartoon, he decided to make toy bears to sell in his shop. He asked president Roosevelt for permission to use the name “Teddy’s Bear” for his toys, as a reminder of the bear Roosevelt had set free. The “Teddy Bear” that Roosevelt pardoned. Shown eating out of a honey jar (as it is such a bad representation of a bear) so one will know it’s a baby bear . A Teddy-bear-that sold-for 110,000 BPS, in December 1994! @ Sotheby’s. Nowadays, everyone knows these toys as “Teddy Bears”, but few people know that they were named after President Theodore ”Teddy” Roosevelt. In March 1909, shortly after the end of his second term, Roosevelt left New York for a safari in Africa. The trip was sponsored by the Smithsonian Institution and the National Geographic Society and received worldwide media attention. His party, which included scientists from the Smithsonian, killed or trapped over 11,397 animals, from insects and moles to hippopotamuses and elephants. 512 of the animals were big game animals, of which 262 were consumed by the expedition. This included six white rhinos. Tons of salted animals and their skins were shipped to Washington; the number of animals was so large, it took years to mount them. Although based in the name of science, there was a large social element to the safari. Interactment withmany native peoples, local leaders, renowned professional hunters, and land owning families made the safari much more than a hunting excursion. Roosevelt wrote a detailed account of this adventure; “African Game Trails” describes the excitement of the chase, the people he met, and flora and fauna he collected in the name of science. 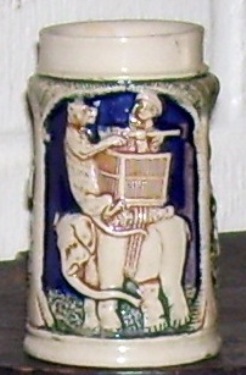 A one liter colored pottery relief stein with the Roosevelt hunting scene (an expanded version of the kinder mug shown above) = sold for over $800.00 in Feb. of 2008. Being a “cross-over stein”, it most likely sold to a political (Presidential) collector and not a stein collector.